This image was scanned from the publication - How Firm a Foundation: A History of the Township of Cramahe and the Village of Colborne in Cramahe's Digital Archives (3bk), p.42. 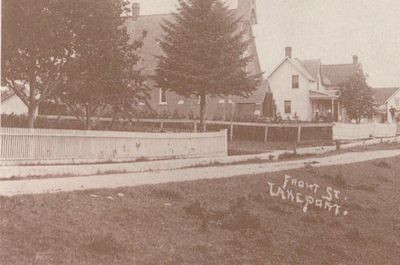 The caption reads: "Front Street, Lakeport, with St. Peter's Church at centre." Argyris, Eileen. How Firm a Foundation: A History of the Township of Cramahe and the Village of Colborne. Erin, Ontario: Boston Mills Press, 2000. Cramahe Archives does not hold the original item in its archives, but has a digital image. Text on postcard: Front St. Lakeport. Copyright, public domain: Cramahe Township Public Library owns the rights to the archival copy of the digital image.